When you become one of Jerry's clients, you're forming a partnership with a highly educated and experienced professional who understands your needs. Jerry is an accomplished Certified Financial Planner™ professional and a Certified Divorce Financial Analyst™ . Working with his clients and their attorneys, Jerry works to forecast the long-term effects of divorce settlements. Developing comprehensive insight into the short and long-term financial effects of divorce can save valuable time, money and distress, especially if the process is conducted early in the legal proceedings. 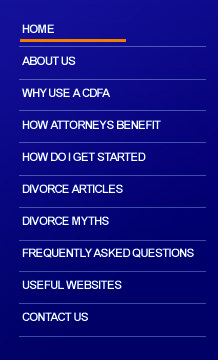 Misinformation and misconceptions about the divorce process can be detrimental. Many have false expectations that they will be able to secure a divorce settlement allowing them to continue with their accustomed style of living. That's not always possible. Jerry is here to help ensure a good, stable economic future and prevent long-term regret with all financial decisions made during the divorce process. 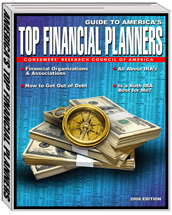 Jerry was named one of America's Top Financial Planners recently by the Consumer Research Council of America and has been recognized year after year by the financial industry for his accomplishments as a financial advisor. You can expect to enjoy a relationship with an accomplished Certified Financial Planner™ (CFP®) professional and Certified Divorce Financial Analyst™ (CDFA™) who understands your needs and is always close at hand to offer guidance and advice based on his experience in the field. Jerry takes a personal interest in every client he represents, always looking to build a solid relationship you can trust. Financial Planning and Consulting services offered through Boda Financial Group Inc., a registered investment advisor.